Life cycle: This insect produces many generations each year and the pupa hibernates in a silken cocoon. Physical Description: This insect is 1 to 1 1/2 inch long caterpillar is yellow, red, or white and covered with long hair. The adult moth is white with a small black mark on each wing, and has awing span of 1 1/2 inches. Its eggs are also covered with hair, and laid in large groups on leaves. 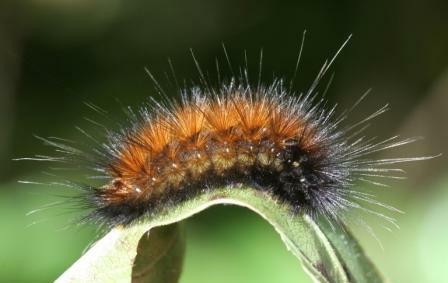 This caterpillar is very similar to other insects, such as, the Fall Webworm, Puss Caterpillar, and Saltmarsh Caterpillar. Feeding characteristics: The Yellow Woollybear attacks Asparagus, Bean, Beet, Cabbage, Carrot, Cauliflower, Celery, Cherry, Chrysanthemum, Corn, Eggplant, Grape, Melon, Pea, Squash, and Verbena by feeding on the foliage, flower, and fruit buds. Controls: For modest infestations, handpicking should be sufficient. This caterpillar can be attracted to your garden by weeds from the cabbage family, such as, Wild Radish, Wild Mustard, and Wintercress. Remove these from the vicinity. You can protect your plants by intercropping a border of plants that repel the cabbageworm such as Onion, Garlic, Tomato, Sage, Tansy, Mint, Southernwood, Nasturtium, Hemp, Hyssop, and Rosemary. Insect predators like various Trichogramma Wasps (commercially available) claim a lot of these pests, but the toxic body contents of the cabbageworm keep birds uninterested. Yellow Jackets feed on this caterpillar, so don't discourage them. The Braconid Wasps are also extremely good controlling insects, and can be encouraged by planting Strawberries near your garden. A repellent can be made by combining, in a mixer, Spearmint, Green Onion Tops, Garlic, Horseradish Root And Leaves, Hot Red Peppers, Peppercorns, and water. Add some pure soap and then dilute and pour it on each plant. Alternatively, you can make a powder of 1/2 cup of salt and one cup of flour and shake it on the cabbage when the morning dew is still present. The worms will eat it, bloat up, and die. This also makes a nice spray when you add water. Canopies made of lightweight polyethylene or nylon netting will keep the moths from laying their eggs on the plants. This won't do any good for surfacing pupae. Bacillus thuringiensis can be used for larger scale crops and problems.